Savvy Spending: Kellogg's Family Rewards: 25 free points! Kellogg's Family Rewards: 25 free points! 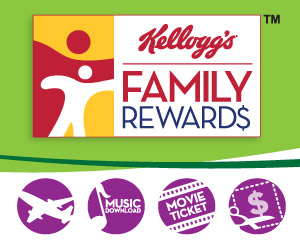 Kellogg's Family Rewards is a great rewards program! You can earn free points just by entering codes that they frequently share! Save up your points to redeem for coupons and gift cards! You can use this code for free points! Go here to enter your codes! Also, Kellogg's will be ending their codes found inside select packages. Instead, you will be able to add points to your account by uploading your receipts featuring Kellogg’s products and/or adding your store loyalty card. You can get a BONUS 200 points when you upload your first receipt and connect a loyalty card.